[148 Pages Report] The complex fertilizers market was valued at USD 44.03 Billion in 2016; it is projected to grow at a CAGR of 6.5% from 2017, to reach a projected value of USD 54.32 Billion by 2022. In this report, the size of the overall complex fertilizers market was derived using forecasting techniques based on the consumption of fertilizers and trade trends in various regions. The segmentation of the market in this report is based on type, crop type, form, and region. In order to complete the overall market engineering process and arrive at the exact statistics for all segments and subsegments, the data triangulation and market breakdown procedures were employed wherever applicable. The data was triangulated by studying various factors and trends from the demand and supply sides. Along with this, the market size was validated using the top-down and the bottom-up approaches. 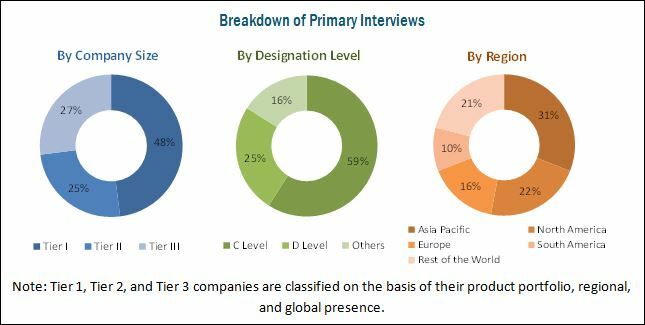 The report includes all possible parameters that affect the markets covered in this research study, which have been accounted for, viewed in extensive detail, verified through primary research, and analyzed to obtain the final quantitative and qualitative data. The figure below shows the breakdown of profiles of industry experts that participated in the primary discussions. The key players that have been profiled in this report include CF Industries Holdings Inc. (US), Yara International ASA (Norway), The Mosaic Company (US), EuroChem Group AG (Switzerland), Potash Corporation of Saskatchewan (Canada), PhosAgro (Russia), Agrium Inc. (Canada), Israel Chemicals Limited (Israel), Sociedad Química y Minera de Chile (Chile), Haifa Chemicals Ltd., (Israel), Helena Chemical Company (US), and Zuari Agro Chemicals Ltd (India). 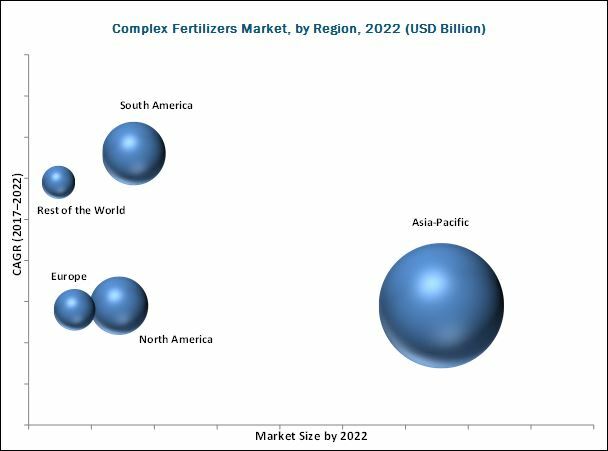 The complex fertilizers market is projected to grow at a CAGR of 6.5% from 2017, to reach a projected value of USD 54.32 Billion by 2022. Both demand and supply of compound fertilizers are expected to witness tremendous growth in 2017, and both are expected to grow steadily in the future. Increased demand for NPK gives fertilizer producers the challenge of finding the most cost-effective solutions to diversify their range of products with the possibility of adapting to the changing market trends and the requirements of their customers. It is estimated that in the next 20 years, the global demand for food and energy will increase by more than 50%; this rise in food demand calls for the use of fertilizers to help enhance agricultural productivity and increase yield, thus driving the market of complex fertilizers. The usage of complex fertilizers in horticulture crops is gradually increasing, as these crops have high demand across the world. Increase in environmental degradation and population is reducing the area of productive land under cultivation, giving rise to the development of fertilizer solutions to sustain this increasing demand for horticultural crops. The Asia Pacific region is the largest consumer of complex fertilizers. The region is mainly dominated by large-scale operations, with an organized distribution chain. Asia Pacific is largely consists of marginal farmers practicing conventional farming methods. The South American market is projected to grow at the highest CAGR during the forecast period, owing to the increase in awareness about the modern agricultural practices. The growth in demand for food is also driving the market; the growth is mainly witnessed in Brazil and Argentina, owing to the rise in awareness and adoption of modern agricultural practices. The African continent has the lowest fertilizer consumption in the world. However, the situation is changing rapidly in some leading countries that are experiencing an economic and population growth, which fuel food demand and production. The rise in awareness about health and wellness, growth of the organic food industry, and the significant increase in the price of chemicals have played a huge role in providing the necessary boost to the global biofertilizers industry, which acts as a restraint for the complex fertilizers market. The uncertainty in prices leads to challenges in production planning and sourcing of raw materials. The cost of ammonia has also been volatile due to lower natural gas costs, which further affects the price of complex fertilizers. Therefore, the fluctuation in the prices of raw materials is a direct challenge that the manufacturers of complex fertilizers need to combat. Visionary leaders primarily focus on acquiring the leading market position through their strong financial capabilities and well-established brand equity. Innovators are players that have a strong focus on innovation and invest heavily in R&D and new product launches. These players hold specific patents in the core market and launch products to gain competitive advantage. Yara International ASA (Norway), Israel Chemicals Ltd. (Israel), Potash Corporation of Saskatchewan Inc. (Canada), Agrium Inc. (Canada), PhosAgro (Russia), CF Industries Holdings, Inc. (US), and The Mosaic Company (US) are the key players in the complex fertilizers market. 11.9 Potash Corporation of Saskatchewan Inc.
11.13 Zuari Agro Chemicals Ltd.
*Details on Business Overview, Strength of Product Portfolio, Products Offered, Business Strategy Excellence, Recent Developments Might Not Be Captured in Case of Unlisted Companies.